An Exhibition of artwork exploring women’s hopes and dreams has been hosted at the Moor Market, Sheffield. ‘Our Hopes and Dreams’ is an exhibition bought to Sheffield by arts charity Ignite Imaginations and social enterprise Aid Works. The exhibition opens today and is open until Monday 5th March at 4pm. Ignite imaginations have organised creative workshops to bring groups of women from Darnall Library, Together Women, Places for People and South Yorkshire Resettlement Programme together. The groups of women shared their hopes and dreams for the futures of them and their families through the medium of art. 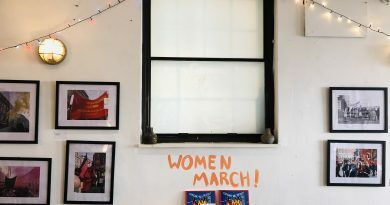 Most of the women involved were refugees who have made Sheffield their home, but the groups also include women who were born and brought up in the city. The opening event was planned to take place tonight at 4-5.30pm but has been cancelled due to the weather. The exhibition is still accessible at the normal opening hours of the Moor Market which is from 8am until 5:30pm every day, except Sunday when it is closed. Admission is free, the project was made possible by the support of the Evan Cornish Foundation and the J G Graves Charitable Trust. I'm Maisie, a 19 year old Journalism Student at the University of Sheffield.